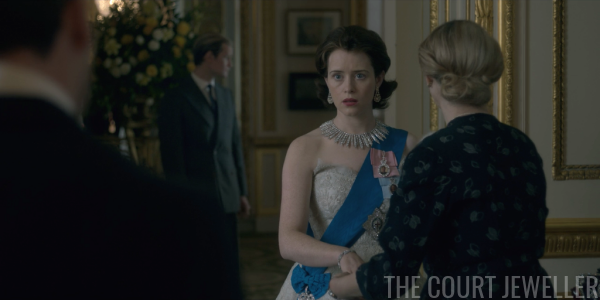 Time for our recap of the jewels worn in the season finale of Netflix's The Crown! 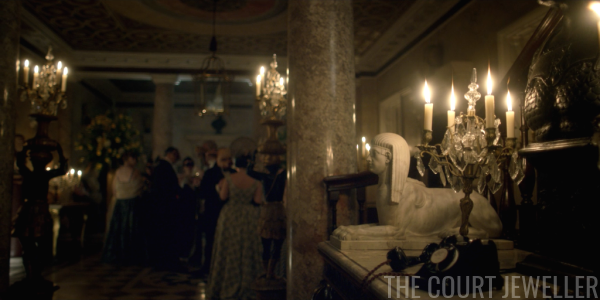 If you've missed any previous recaps, you can find them here. Now, though, it's time for "Gloriana." 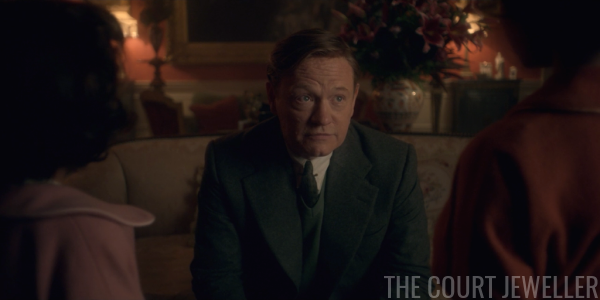 We begin in flashback mode: it's December 10, 1936, the day of Edward VIII's abdication. (The 80th anniversary of this date, one of the most important moments in the history of the British monarchy, was this past weekend.) David is still king, but he's dancing merrily with a bejeweled Wallis as his kingship metaphorically burns. 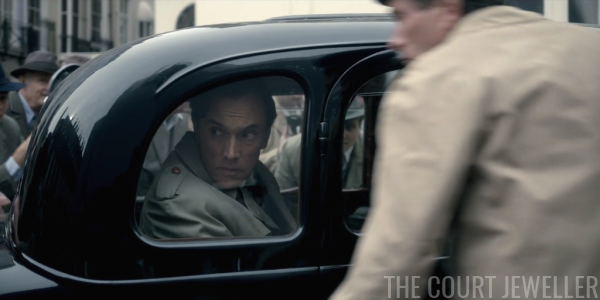 Along with the pieces that are visible here, Wallis is also wearing the Cartier cross bracelet. 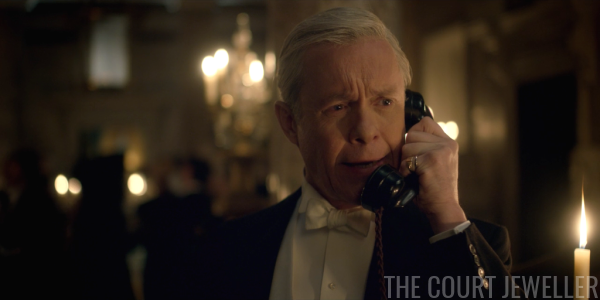 David calls Bertie in and breaks the news to him that he'll now be king. 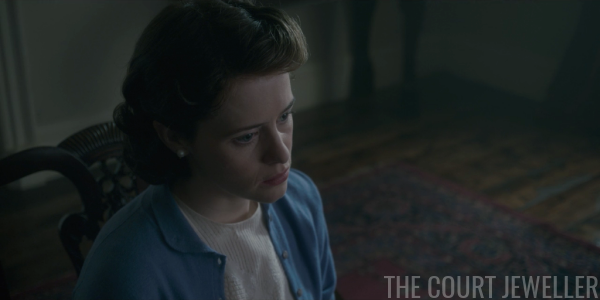 One of Bertie's first thoughts is for his daughters, and he goes straight to see them. 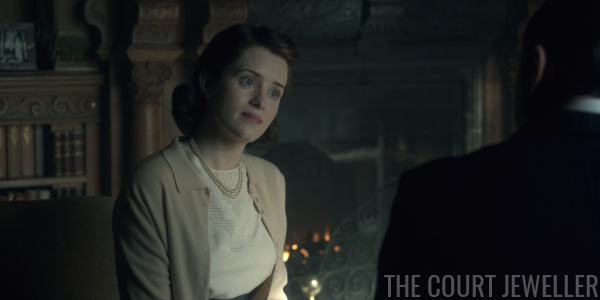 He makes Elizabeth and Margaret solemnly promise that they'll never let each other down -- a promise that has been tested repeatedly this season. 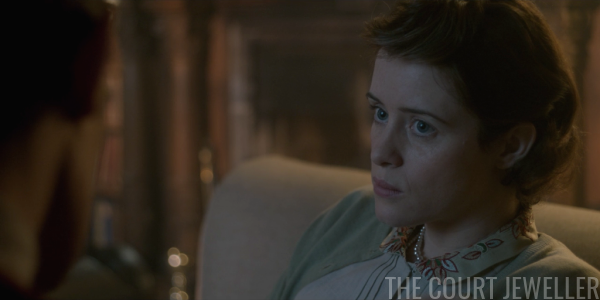 Margaret, in the necklace she wore the night before her father's death, announces that she is still firmly resolved that she'll marry Peter. Elizabeth, in pearls, smiles happily, clearly pleased that the two-year waiting plan worked out. Meanwhile, the family is enjoying the Scottish landscape. 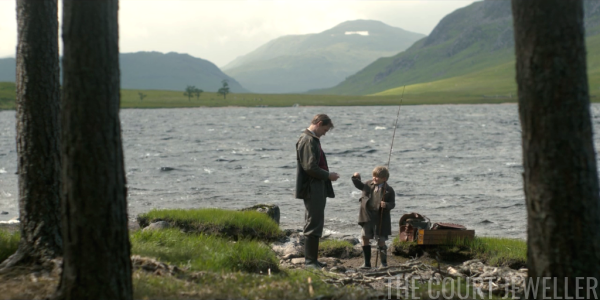 Philip is fishing with wee little Prince Charles, who is featured more than once in the background of this episode. He is, after all, someone who will have to wrestle with some of the same questions about divorce, church, and country eventually. 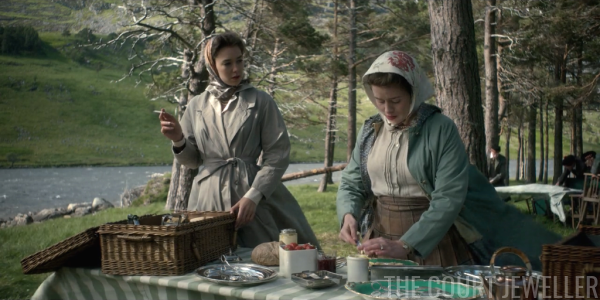 Margaret and Elizabeth are doing picnic food prep in pearls. 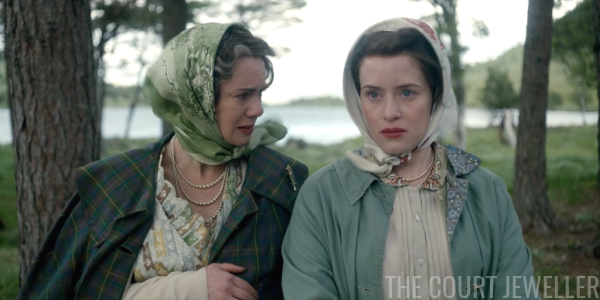 Elizabeth has told her that she still has to seek parliamentary approval, which will involve even more waiting, and Margaret is predictably displeased. 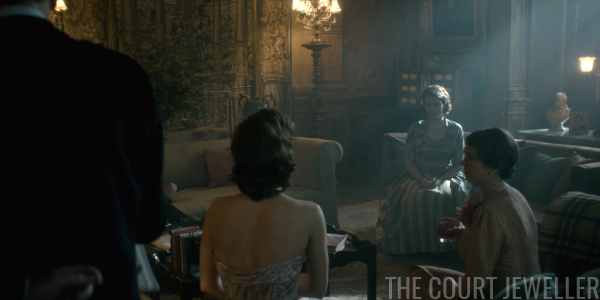 Also displeased: the Queen Mother, who is worried about the way that Philip treats sensitive, gentle Charles. 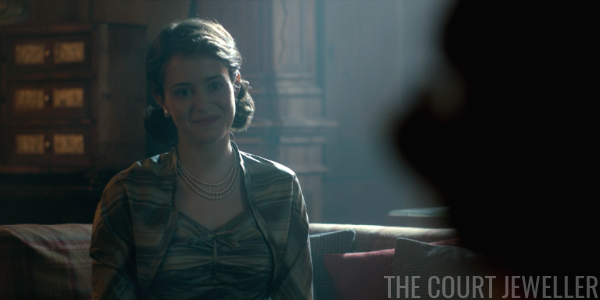 She's got a plan to deal with Philip. 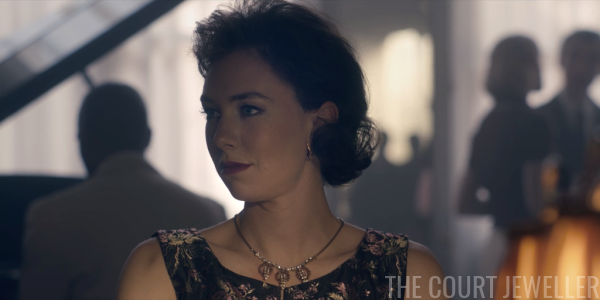 I'm pleased to see that the costume designers put her in a brooch as well as in pearls for this scene; they've really missed out on some super brooch opportunities for her character this season. 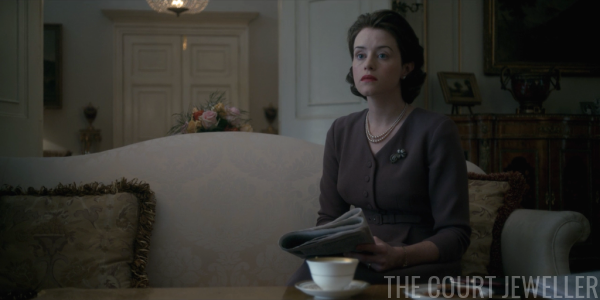 Margaret wears pearls as she watches newsreel footage on television. Anthony and Clarissa Eden arrive at Balmoral. He's fresh from a trip to Cairo, which was fraught with all sorts of diplomatic pitfalls. 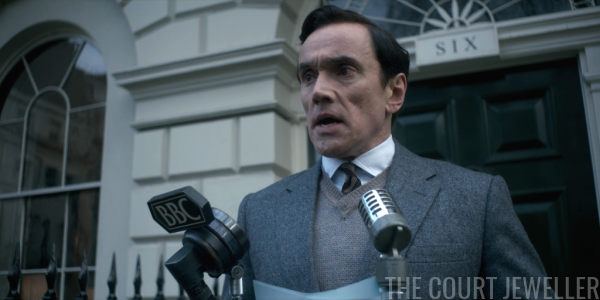 The series is clearly gearing up to make the Suez Crisis a major part of season two -- they've been building the story gradually since Ed Stoppard's character's presentation about the Egyptian military coup a few episodes ago. 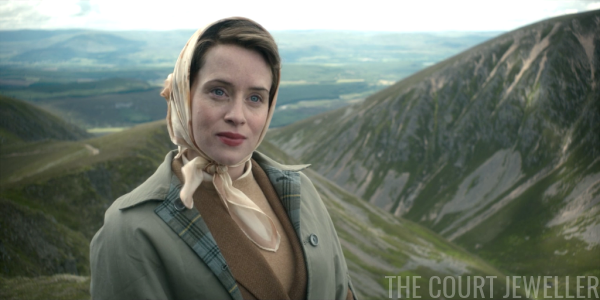 Elizabeth takes advantage of the Highland setting for her audience with Eden. 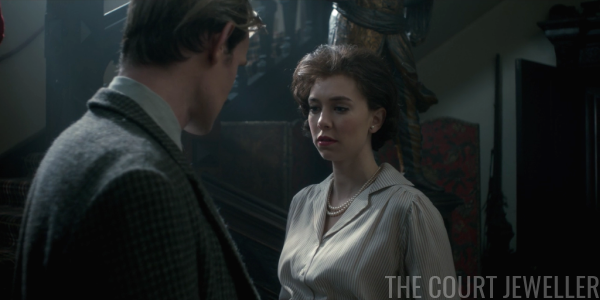 They discuss Cairo, and then move on to the Princess Margaret problems. 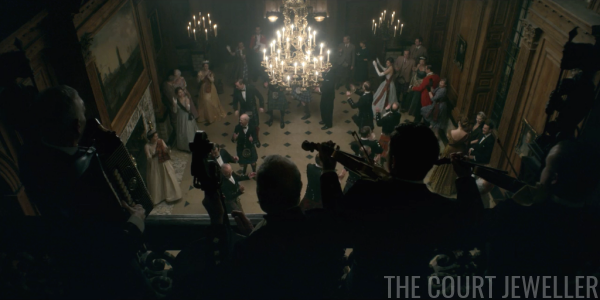 Later on, the family reels merrily in formal wear and tartan. 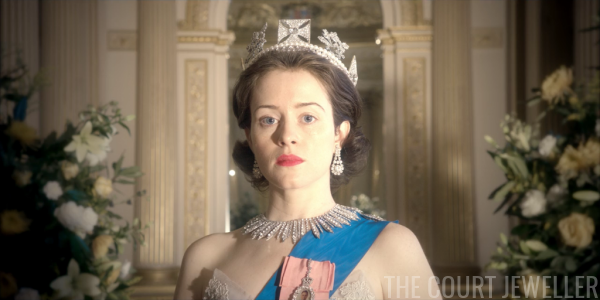 The Queen Mother wears both replica and invented jewels: the Greville Tiara, Queen Alexandra's Wedding Necklace, and the earrings created by the production to "match" with that necklace. 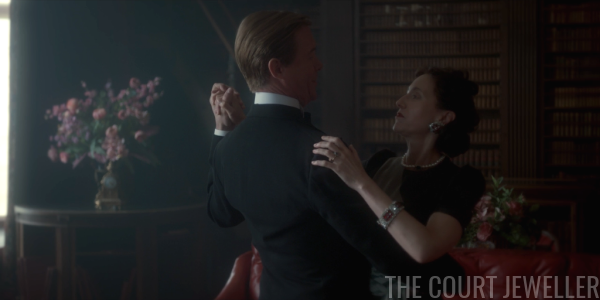 She dances with Philip and chides him for being such a whiner. 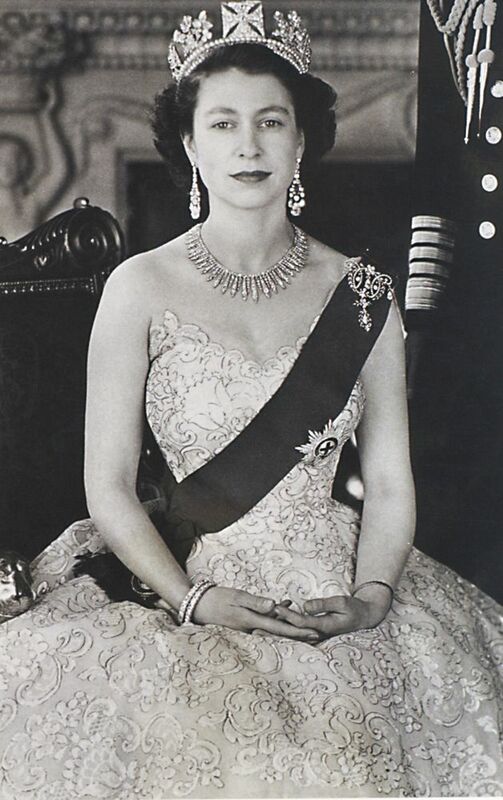 Elizabeth wears the Lover's Knot Tiara with a diamond necklace. He and Margaret rendezvous at Clarence House where, predictably, they furiously canoodle. But the news about their impeding marriage gets worse and worse. 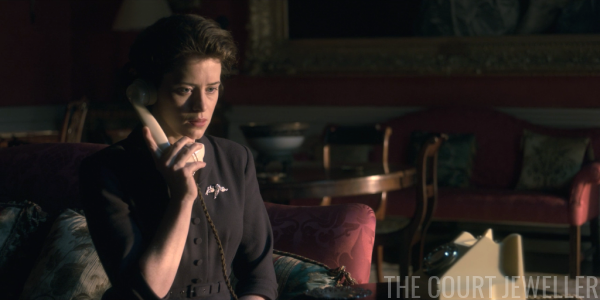 Eden informs Elizabeth that the only feasible solution is for Margaret to renounce her royal status, for the couple to have a civil marriage outside the country, and for them to live abroad, at least for a while. (So, basically: the David and Wallis Special, but with even less monetary support from the royal family.) 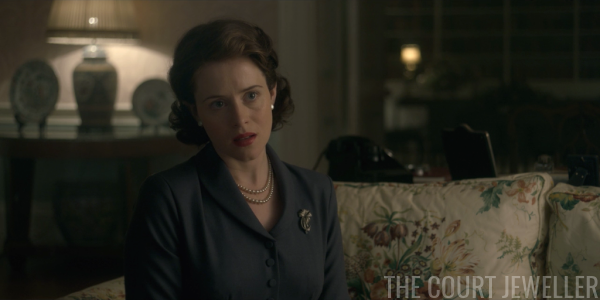 Elizabeth looks ill (and wears the "ribbon" brooch) as she tells her sister. And Margaret doesn't look like she feels much better. Note that she's wearing her royal pearl uniform while she hears the news that she'll have to give up her HRH (and her family!) to have Peter. She and Peter soldier on, though, at a country house party hosted by a friend. 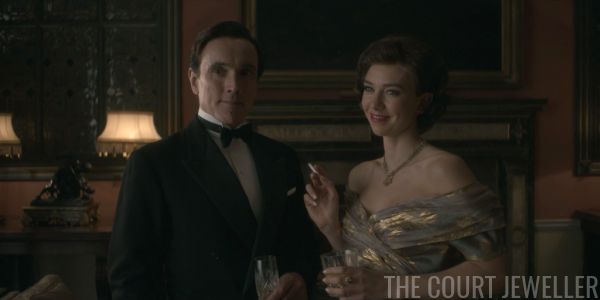 (In real life, they spent a weekend with Lord and Lady Rupert Nevill in Sussex around this time.) 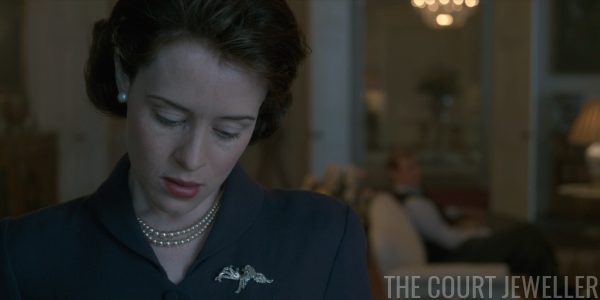 Note that Margaret's wearing the same jewelry that she wore when she and Peter had Elizabeth and Philip over for dinner. Back at Buck House, Elizabeth wears the "ribbon" brooch as she watches images of Margaret and Peter on television (and, presumably, takes notes on racing information). We find out quickly that Eden, who is still suffering from pain after his surgery, is dependent on powerful painkillers. (This was true: he was prescribed a major, mind-altering combo of drugs while he was serving as PM.) 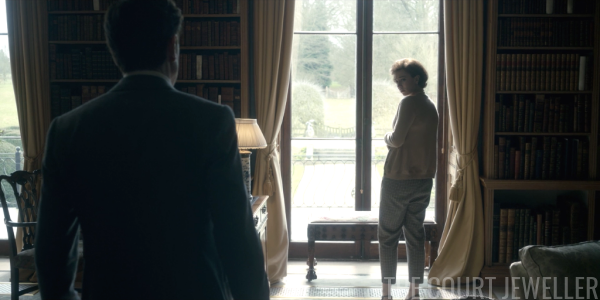 He stops by BP to tell Elizabeth that many members of the government have threatened to resign if Margaret goes ahead with the marriage. 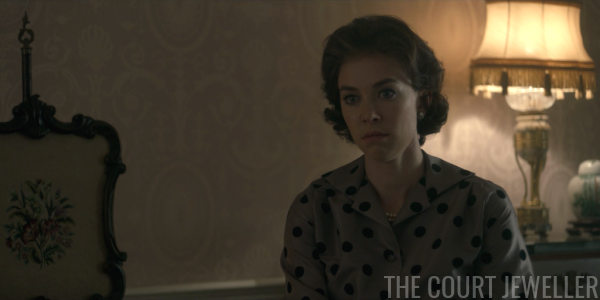 This is Elizabeth's face as she reminds him that many of them -- including him! -- are divorced themselves. 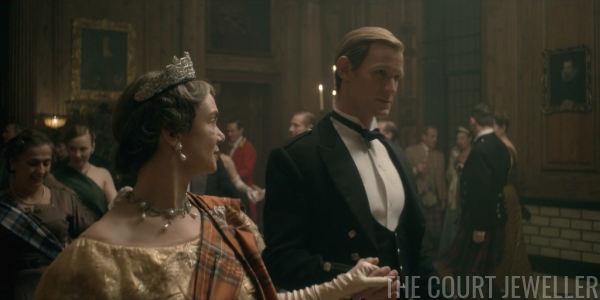 She tells him about the oath that her father made her make, promising not to betray her sister. But the government isn't the real obstacle. Ultimately, that's the church. Remember that, in Britain, the monarch is the head of the official state church. 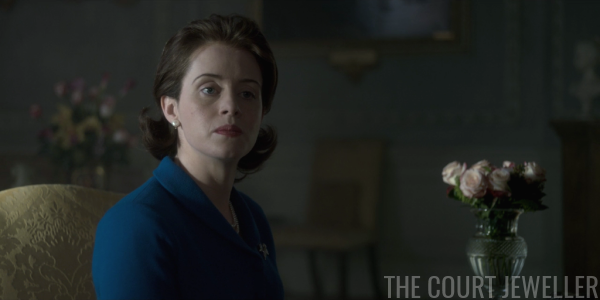 Also remember how important that anointing scene was in the coronation episode. 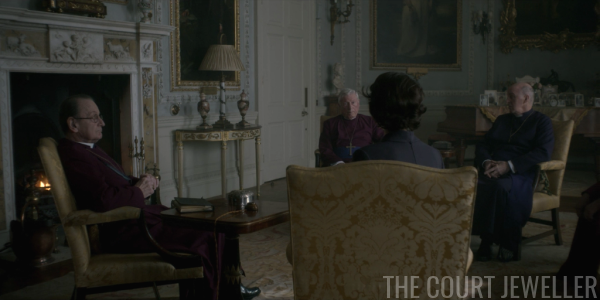 Elizabeth calls the Archbishop of Canterbury and several other bishops over to the palace for a discussion. They remind her of that other oath she made: her promises to God as she was anointed with holy oil. But really, what does Uncle David know? He wasn't ever crowned, let alone anointed -- which is why he was able to give everything up. He never lived as both a divinely-anointed monarch and as a human. 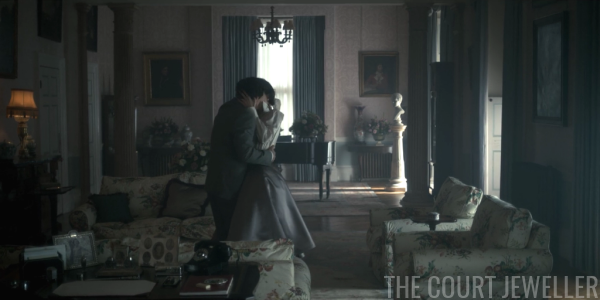 Remember how that moved him to tears during the coronation episode? 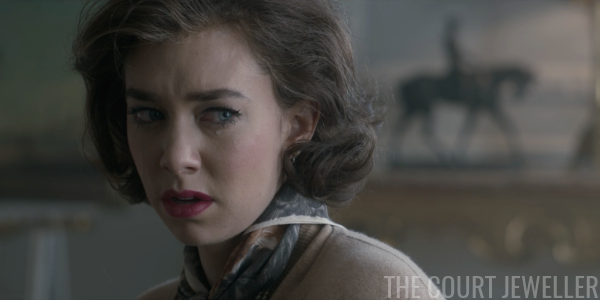 Note that Margaret's pearl earrings are gone here -- she's just wearing simple hoops. 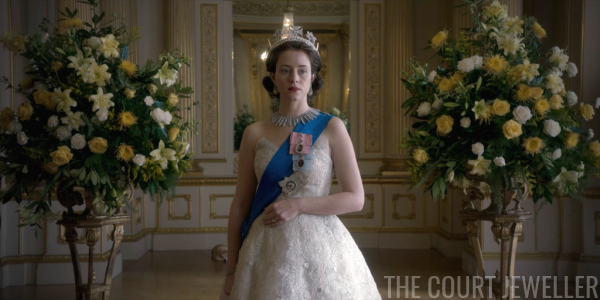 Will she leave the pearly uniform of royalty behind for true love? 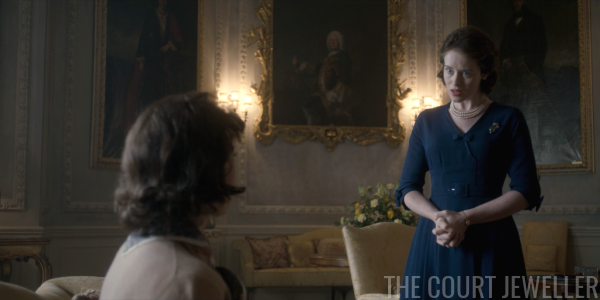 She and Peter meet at Clarence House, and the look Margaret gives him tells us that their marriage isn't going to happen. Townsend informs the press that he and Margaret have split. So, in real life, Peter and Margaret collaborated on the statement that was released to the press, but ultimately, the statement was in Margaret's name. Why give those words to Townsend alone, rendering Margaret publicly silent? 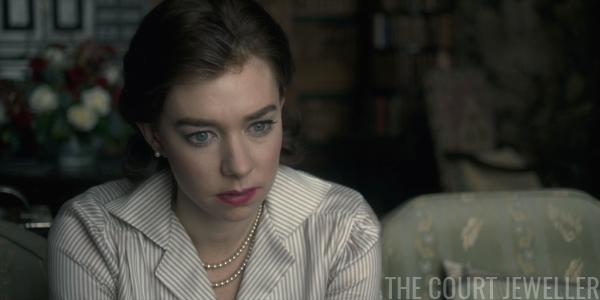 ...and it also looms down, rather judgmentally, on pearl-wearing Elizabeth. 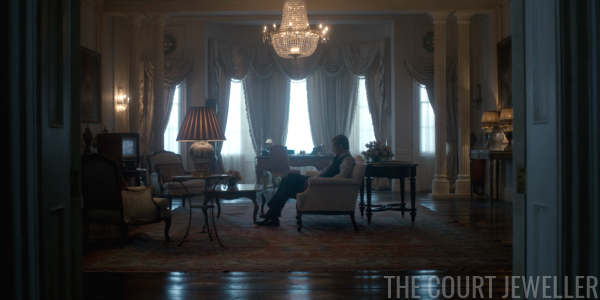 Philip watches all of this, including commentary about choosing country over self, on television. 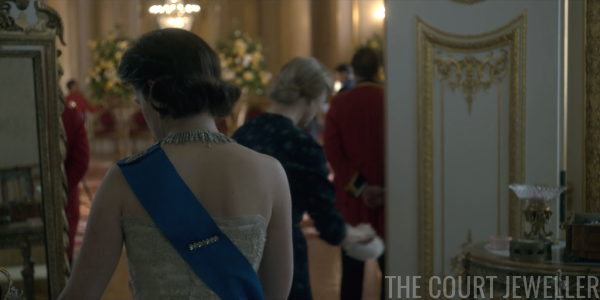 We get a decent shot of the back of Elizabeth's ensemble -- including a bar brooch securing the Garter sash -- as Philip tells her he'll be going. 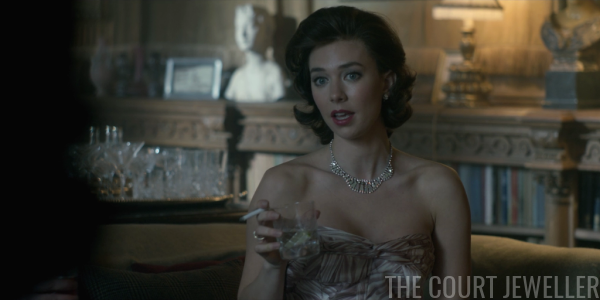 Meanwhile, Margaret wears era-appropriate jewels as she tries to happily socialize after ending her engagement. 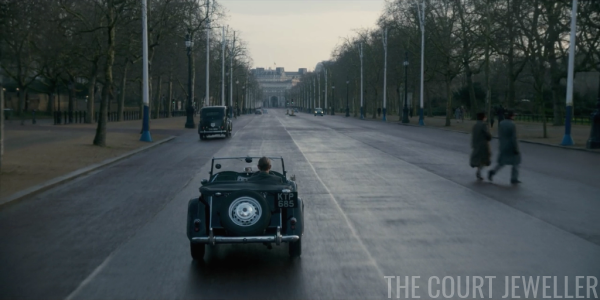 And Philip speeds away from the Palace. 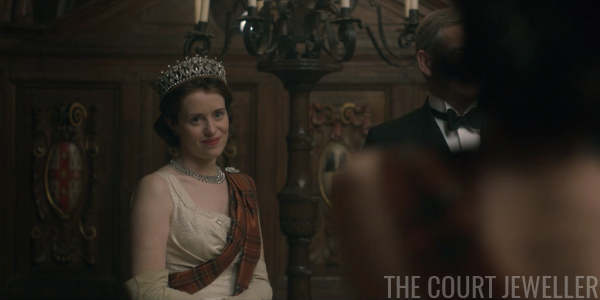 But as the photographer zooms closer and asks her to inhabit the role of "Gloriana," the rings disappear. ("Gloriana" was the name that Spenser used for Queen Elizabeth I in The Faerie Queene.) 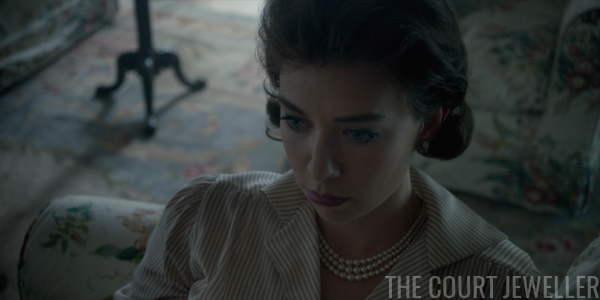 The camera's flash brilliantly illuminates the frame, and Elizabeth levels us directly with her gaze. After all of the events of the season -- from her marriage and accession to Churchill and Townsend -- she is Gloriana. 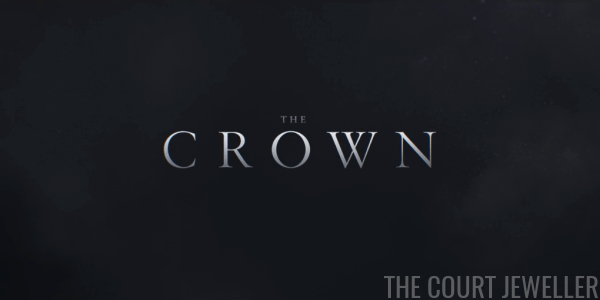 She knows now that she can never really separate her personal self from the Crown again. Stay tuned later in the week for a discussion of some of the jewels we didn't see in season one!